×	Issue 4 - Green! Home / Shop / Magazine Issues / Buy Issue 1 – Revolution! View basket “Issue 4 – Green!” has been added to your basket. 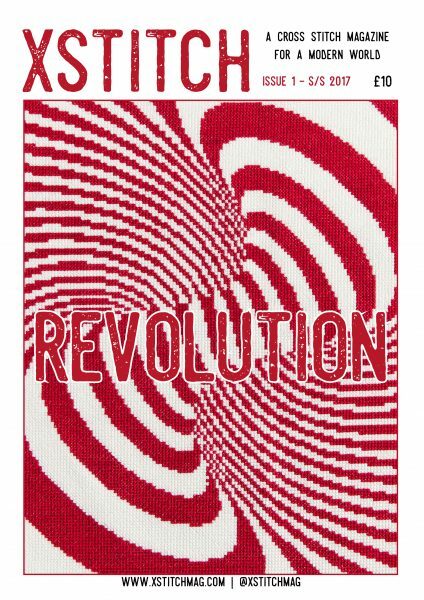 Issue 1 of XStitch Magazine is Revolution themed! It’s a game changing mag with 20 cross stitch patterns from the hottest design talent in the world! Grab your limited edition copy while stocks last! Issue 1 of XStitch is available to purchase now! With brand new designs from some of your favourite cross stitch heroes, all of whom are responding to the theme of REVOLUTION, there’s guaranteed to be something you’ll love to stitch! Issue 1 has 100 pages and is a limited edition run. There will be no second printing so get this exclusive first edition while stocks last! Issue 1 contains designs from familiar names like Maria Diaz and Emily Peacock, rising stars like Floss & Mischief and Lord Libidan, international artists like Niki McDonald and Ellen Schinderman, and brand new talent like PyroDogPins and Kate Blandford. It’s a unique mix of designers that you won’t find anywhere else! As well as the designs, there are thought provoking columns from Spike Dennis and Betsy “Craftivism” Greer, an interview with Theo “Crapestry” Humphries, product review from Grace at Beyond Measure, advice from Mary at FY Needlework, and also tips and techniques to help you improve your stitching! Issue 1 also has a collaborative playlist for you to enjoy, with contributions from each designer! What more could you want?! Issue 1 of this limited edition, game changing magazine is yours for only £10. Come and join the revolution! 1 review for Buy Issue 1 – Revolution! Really great magazine, so good to see unusual and thought-provoking patterns. It’s really nicely laid out and presented, with articles about where the patterns came from (history, culture etc) – which makes it even more interesting. Good range of designs, rather than all being a variation on the same theme. The hardest one is deciding which one to stitch first. Great print quality, far better than a lot of the mass-produced ones. I can’t wait for issue two.